Within the prpl Foundation Security Working Group, Imperas is providing solutions for embedded hypervisor/OS developers. Simon Davidmann, Imperas CEO wrote a guest blog for RTC Magazine. RTC Magazine focusses on Embedded Computing and includes information for both hardware and software developers of embedded systems. The article is about the security of embedded systems and what the prpl Foundation is doing about it, and what its Security Working Group is focussed on. Most of the public discussion about security presents various aspects of the problems, or a high level view of risks/solutions, or an individual company’s solution to their slice of the problem. The prpl Foundation’s Security Working Group is taking a pragmatic, cross-functional approach to security in embedded devices and systems. Imperas’ CEO discusses challenges with software development and how things need to change. What do software engineers want today? What are some of the biggest challenges that software engineers face today? What about the notion of software reuse? How can software be developed with a higher level of confidence that it is of higher quality? What is the measurement of quality in software? 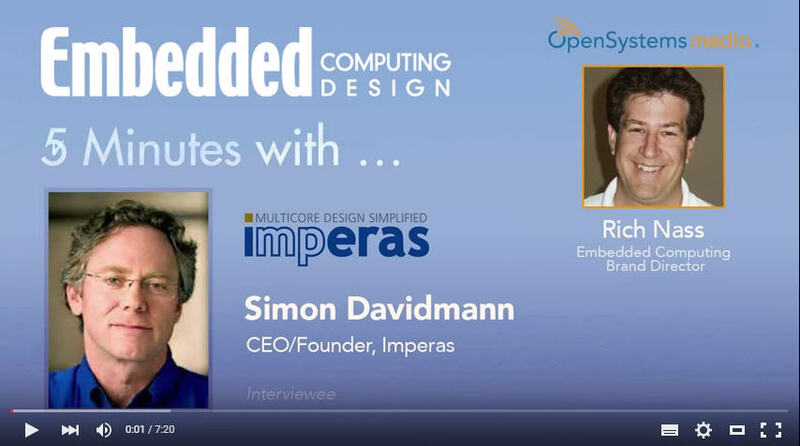 Simon Davidmann, Founder and CEO of Imperas is a self-described "serial engineer." A what? Well, listen to the five-minute interview and you'll understand what that means. As a long-time veteran of the EDA industry, Simon and Rich talked about ... click here to read more and listen to the audio interview. Rome was certainly not built in a day and neither was your next embedded software project. 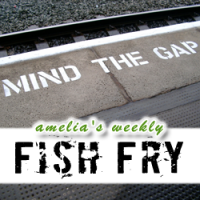 In this week’s Fish Fry, Amelia Dalton of Electronic Engineering Journal takes a closer look at virtual platform-based methodology for embedded software development with Simon Davidmann (CEO - Imperas). Simon and Amelia discuss the advantages of the Open Virtual Platform Consortium. and how virtual platforms can speed up your design process. In a recent article in Semiconductor Engineering, Ann Steffora Mutschler states that as designs become part of connected networks, so do the requirements for what’s needed to make it work properly. Defining a system used to be relatively straightforward. But as systems move onto chips, and as those chips increasingly are connected with applications and security spanning multiple devices, the definition is changing. This increases the complexity of the design process itself, and it raises questions about how chips and software will be designed and defined in the age of the Internet of Things/Everything. For example, will engineers be developing software-defined hardware, network-defined software and hardware, or application-driven connected systems? Larry Lapides of Imperas recently posted a guest blog at the Imagination MIPS processor blog site. it discusses topics related to Operating System bring up and how virtual platform and advanced tools can provide signiificant benefits. Linux has become the general purpose operating system of choice for embedded systems, and is almost always supported for high end SoCs developed by semiconductor vendors. These SoCs now have multicore processors, and run symmetric multiprocessor (SMP) Linux. Most vendors start with the MIPS Linux distribution, then customize it for the specific SoC (requiring device tree changes), including the necessary drivers for the peripherals on the SoC as well as supporting other customizations and unique features. While the MIPS Linux distribution is a great starting point, that does not make customization and bring up an easy task. To put it another way: Just because you get to the Linux prompt doesn’t mean everything is working. Just where do virtual platforms fit in this? In a recent article in Semiconductor Engineering, Ann Steffora Mutschler explores examples of architectural strategies for getting the best performance out of a power budget. Virtual platform developer Imperas Software's tools are being used for power estimation, to enable dynamic analysis of the impact of the complete software stack - OS, firmware, applications - on the power consumption of SoCs and systems, according to CEO Simon Davidmann. "We have seen various architectures used by our customers with power constraints. What most of these architectures have in common is heterogeneity: using the right processor for the appropriate task." At the Imagination Technologies Silicon Valley Summit in May 2015 there was a series of presentation and discussions regarding Virtualization, Security and the prpl Foundation. 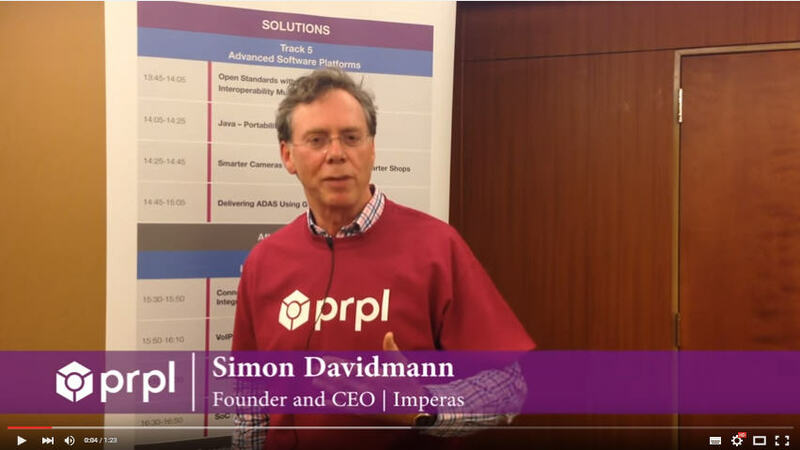 Imperas is a founding member of the prpl Foundation Security PEG (prpl Engineering Group) and is working to provide solutions to assist electronic product developers to remove risks associated with embedded software development. Several videos were recorded regarding prpl at the IMG summit - these can be viewed on the prpl youtube channel here. 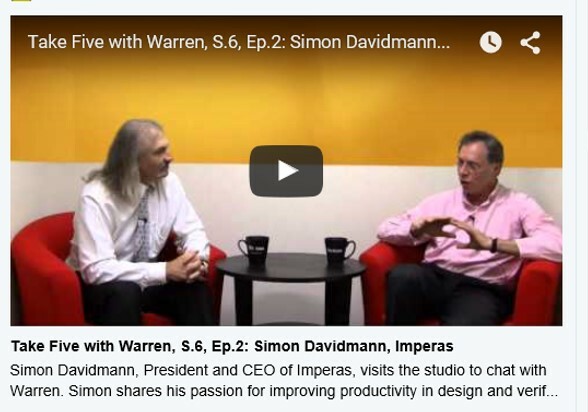 To see the comments from Simon Davidmann, Imperas CEO, click here.